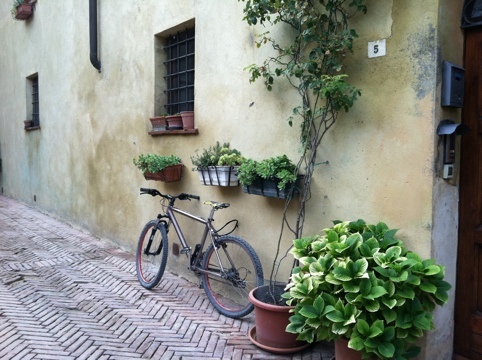 Agriturismos (agricultural tourism) began in the 1980s as a way for small farmers to survive in a modern economy. By renting rooms to travelers, farmers can remain on their land and continue to produce their crop. 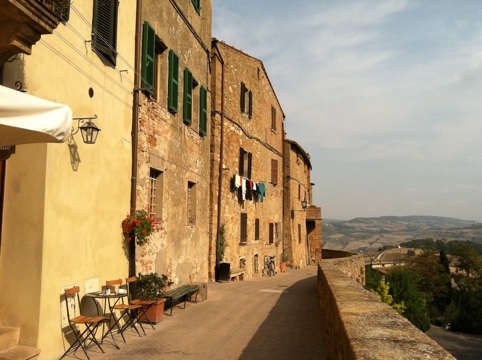 Eva and I chose Agriturismo Terrapille in Pienza and use it as our base for site seeing, wine tasting, and relaxation in the Tuscan hillside. 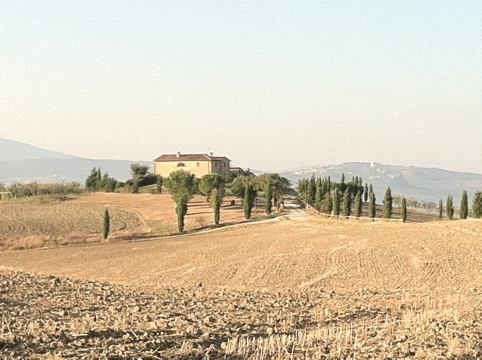 After tenant farming the land for 29 years, the Mangiavacchi family bought the property from a conservatorship that was dividing and selling assets. Grandfather “M” loved the property, but could never get the conservatorship, or the prior owners to sell. He ran to the bank the minute he heard of the pending sale, bought the farm, and continued working the land. His son, Guiliano, inherited the land and in 1993 decided to completely remodel the dilapidated stone farm house, (built in 1000 a.d.) and convert it to an agriturismo. The project took four years, and in 1997 Guiliano, his wife, Elsa, and their daughter and her husband, Lucia and Lyes, opened the new Agriturismo Terrapille. Our proprietors left us to unpack and explore the property. Terrapille is comprised of two buildings, the barn with two apartments and four rooms, and the storage building remodeled with a lobby, professional kitchen and dining room. There are three lovely decks, each with a spectacular view, however the best view is from the outdoor pool which we didn’t waste time to enjoy by kicking off our shoes, plop onto lounge chairs, and begin daydreaming of days of wine tasting, whimsy, and relaxation. I know that I am biased in saying that Terrapille has the best view and location than the surrounding farms, but apparently Ridley Scott must agree when he used the location for Russell Crowe‘s home in Gladiator (substantiated by the Mangiavacchi family, although much to their dismay a stunt double was used for Russell Crowe’s scenes). 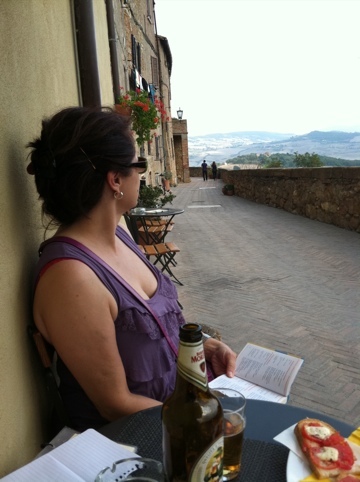 Relaxation didn’t last long when we realized that to complete this picture we would need some provisions for our week by the pool, and we drove up the hill to explore Pienza. A wine shop with a very bored proprietor (I’m still wondering why we gave him our euros) provided two bottles of a locally made Brunello when we asked, “Cosa mi consiglia?” Our search for edibles was interrupted when we stumbled upon a charming bar on the panoramic promenade. Italian bars are not the dark cocktail lounges known by Americans. 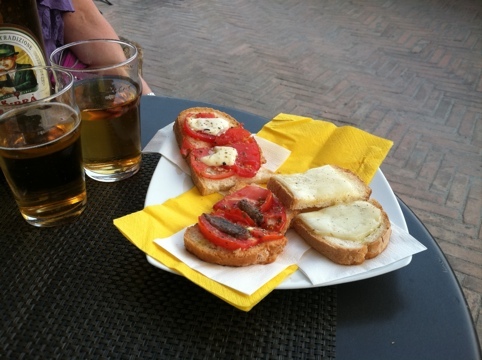 In Italy, the sign hung outside may say “bar”, but it more closely resembles a cafe. They serve pastries for breakfast, sandwiches and snacks for lunch, and simple entrees, cocktails or wine for dinner. Espresso drinks are served all day and the bar is where you place your order and/or drink your beverage, standing, of course. 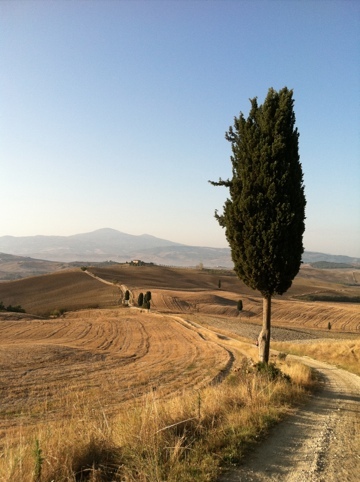 We took our Morettis and crostini out onto the promenade, exchanged stories with a couple from San Francisco, and breathed in the rolling Tuscan hillside. 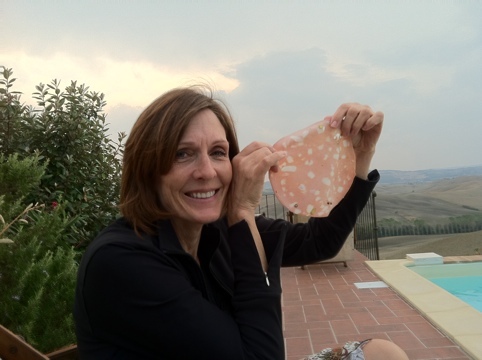 We bid arrivederci to our friends, and completed our purchases at the alimentari where we found limoncello and ricciarelli cookies, locally made pecorino, several choices of prosciutto, and Eva’s new Italian lover, mortadella. The only item missing was pane, which had to be purchased at a panetteria, of course. Nessun problema! We will continue the search domani. It was time to head back to Terrapille and catch our first Tuscan sunset by the pool. La dolce vita!